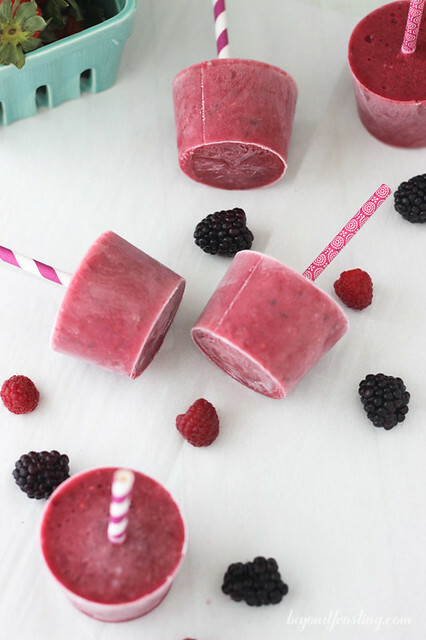 This easy Very Berry Fruit Popsicles are simple to throw together. Use whatever berries you have on hand: blueberries, strawberries, raspberries or blackberries. Blend with a banana, vanilla yogurt and some orange juice. The hardest part is waiting for them to freeze. I think I am going through a bit of spring fever. The first half of the year was so busy for me, yet I find myself sitting here looking forward to the next adventure. It’s almost like Memorial Day is already here and I am ready to be on vacation again. Is anyone else feeling this way? I think part of the reason I am feeling this way is because I have been making so many summer desserts lately. 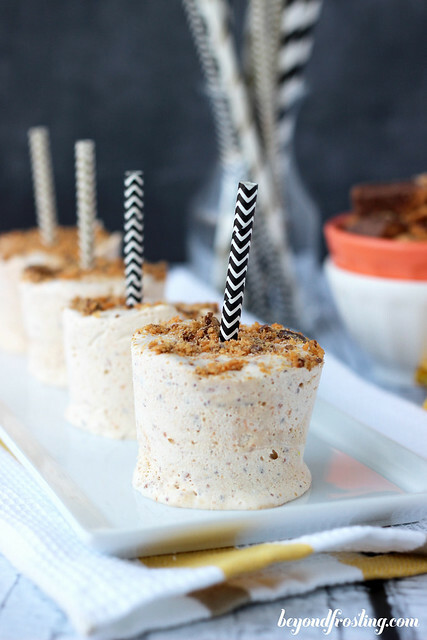 Thoughts of no-bake desserts, popsicles and milkshake circulate in my mind all day long. 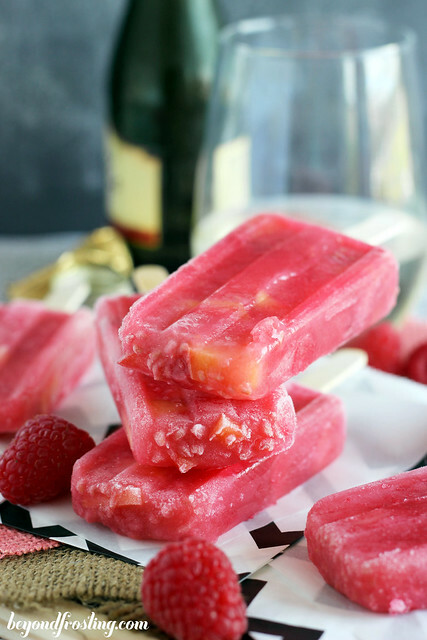 It should come as no surprise that I am sharing another popsicle recipe today! 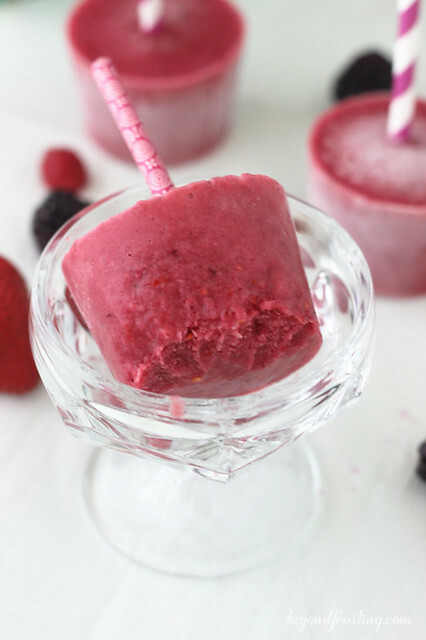 These Very Berry Fruit Popsicles are a throwback recipe for me. I have memories of my mom making these for us during the hot summer months. I envision us sitting in our backyard on the trampoline in our swim suits enjoying these popsicles. My mom used to make these all the time in the summer. They were so quick and easy to throw together with leftover berries, bananas, yogurt and juice. 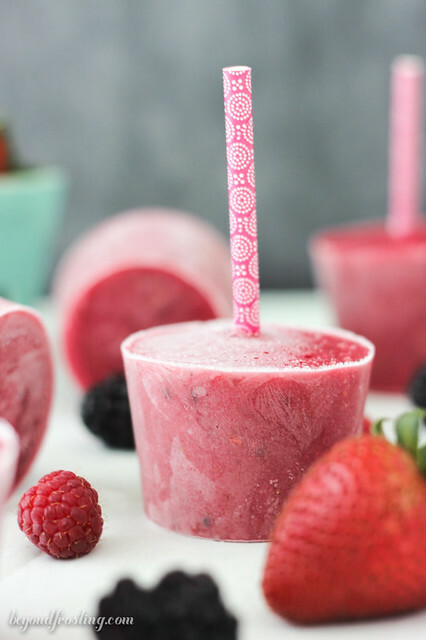 You don’t even need fresh berries, you can use frozen berries too. 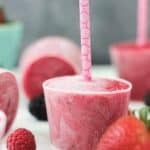 If we were too impatient to wait for them to freeze then we would just drink these straight from them blender and she called them “fizzy fruit shakes”. I am fairly certain she just keep feeding us popsicles to have about 10 minutes of silence before our popsicles started to melt. We always had plenty of berries in the house because my Mom had a huge garden. In the back of the garden was several rows of raspberries. I loved going to pick fresh berries from the garden, except when the bees were around! There was always frozen raspberries we could grab in a pinch for these popsicles. The best part about these popsicles is that they can be totally tailored to your own taste or availability of fruit. I used blackberries, raspberries and strawberries along with a banana. I blended these together with a little bit of vanilla yogurt (I used non-fat) and orange juice or water if you want to cut down the sugar. For the yogurt, I prefer a non-fat vanilla or greek yogurt. Then you just divide it between a few paper cups and put a popsicle stick in it. Easy peesy right? I still have a few leftover popsicles in my freezer. These are perfect to keep on hand when you need something to cool you down. Divide between 6-8 paper cups. 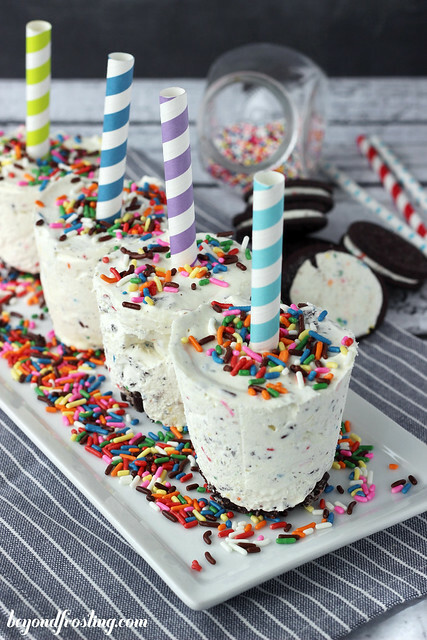 Place popsicle stick in the middle of the paper cups. I’m obsessed with these!!! 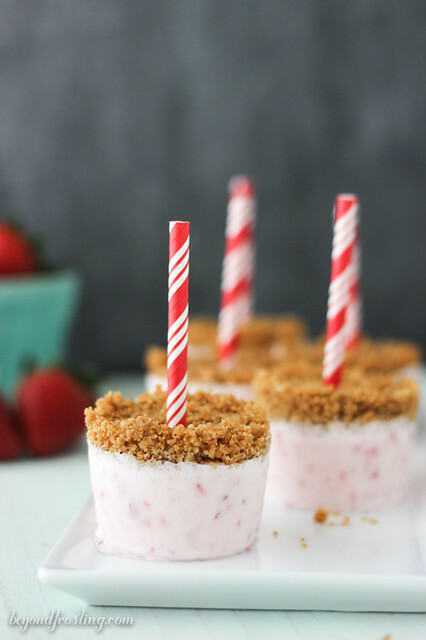 They’re healthy and totally pretty (love those cute straws!). Pinned! And thank you for the link love, too! Could they be made without the yogurt for a dairy free option? We have a dairy allergy now. Hi Lauren, yes I am sure! The texture might not be as smooth, but they will freeze just fine. Or you can substitute with a soy yogurt or coconut milk yogurt. I love these fabulous little popsicles! 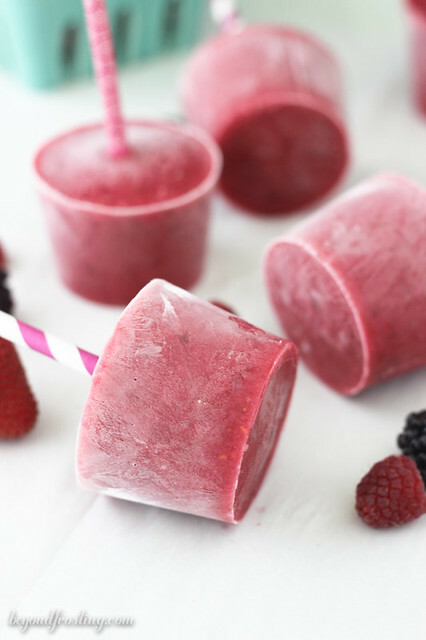 They look so refreshing and I love that they’re mixed berry flavored, one of my favorite fruit bar flavors! My mom used to always make these for us too! She would always use frozen strawberries because we always picked a bunch in spring and froze them so we could use them all year long. So good on a hot day!! If there was one thing I knew we could find in the freezer, it’s berries! These are so fun and beautiful! I love recipes like this that are so easy to make but perfectly gorgeous for entertaining!! Thanks lady! It is a great one to have on hand! I love finding good popsicle recipes, especially if they are made with fresh berries! Perfect for summer! Thanks Ashley! 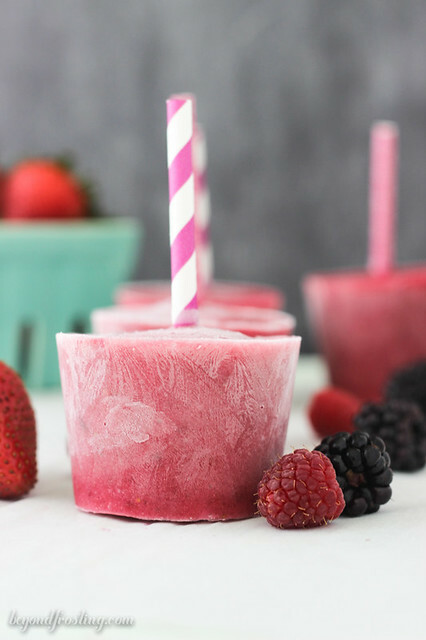 I love a reason to freeze berries for later! Mom does always know best! I totally admit to giving my kids snacks just for that 10 minutes of quiet! It’s so nice. Very calming. These look so good! I am excited to add them to the popsicle roster this summer, for sure. HAHA! There is no shame in that!